The pyrimidine ring system has wide occurrence in nature as substituted and ring fused compounds and derivatives, including the nucleotides cytosine, thymine and uracil, thiamine (vitamin B1) and alloxan. It is also found in many synthetic compounds such as barbiturates and the HIV drug, zidovudine. Although pyrimidine derivatives such as uric acid and alloxan were known in the early 19th century, a laboratory synthesis of a pyrimidine was not carried out until 1879, when Grimaux reported the preparation of barbituric acid from urea and malonic acid in the presence of phosphorus oxychloride. The systematic study of pyrimidines began in 1884 with Pinner, who synthesized derivatives by condensing ethyl acetoacetate with amidines. Pinner first proposed the name “pyrimidin” in 1885. The parent compound was first prepared by Gabriel and Colman in 1900,  by conversion of barbituric acid to 2,4,6-trichloropyrimidine followed by reduction using zinc dust in hot water. ^ "Front Matter". Nomenclature of Organic Chemistry : IUPAC Recommendations and Preferred Names 2013 (Blue Book). Cambridge: The Royal Society of Chemistry. 2014. p. 141. doi:10.1039/9781849733069-FP001. ISBN 978-0-85404-182-4. ^ Brown, H. C.; et al. (1955). Baude, E. A.; F. C., Nachod (eds.). Determination of Organic Structures by Physical Methods. New York, NY: Academic Press. ^ Gilchrist, Thomas Lonsdale (1997). Heterocyclic chemistry. New York: Longman. ISBN 978-0-582-27843-1. ^ a b c Joule, John A.; Mills, Keith, eds. (2010). Heterocyclic Chemistry (5th ed.). Oxford: Wiley. ISBN 978-1-405-13300-5. ^ a b Lagoja, Irene M. (2005). "Pyrimidine as Constituent of Natural Biologically Active Compounds" (PDF). Chemistry and Biodiversity. 2 (1): 1–50. doi:10.1002/cbdv.200490173. PMID 17191918. ^ Grimaux, E. (1879). "Synthèse des dérivés uriques de la série de l'alloxane" [Synthesis of urea derivatives of the alloxan series]. Comptes Rendus Hebdomadaires des Séances de l'Académie des Sciences. 88: 85–87. ^ Kenner, G. W.; Todd, Alexander (1957). Elderfield, R.C. (ed.). Heterocyclic Compounds. 6. New York: Wiley. p. 235. ^ Pinner, A. (1884). "Ueber die Einwirkung von Acetessigäther auf die Amidine" [On the effect of acetylacetonate ester on amidines]. Berichte der Deutschen Chemischen Gesellschaft. A17 (2): 2519–2520. doi:10.1002/cber.188401702173. ^ Pinner, A. (1885). "Ueber die Einwirkung von Acetessigäther auf die Amidine. Pyrimidin" [On the effect of acetylacetonate ester on amidines. Pyrimidine]. Berichte der Deutschen Chemischen Gesellschaft. A18: 759–760. doi:10.1002/cber.188501801161. ^ Gabriel, S. (1900). "Pyrimidin aus Barbitursäure" [Pyrimidine from barbituric acid]. Berichte der Deutschen Chemischen Gesellschaft. A33 (3): 3666–3668. doi:10.1002/cber.190003303173. ^ Lythgoe, B.; Rayner, L. S. (1951). 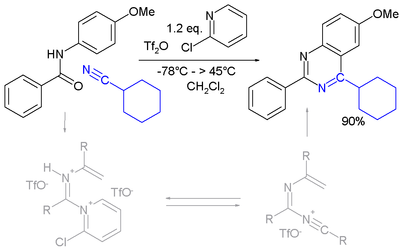 "Substitution Reactions of Pyrimidine and its 2- and 4-Phenyl Derivatives". Journal of the Chemical Society. 1951: 2323–2329. doi:10.1039/JR9510002323. ^ a b c d e f g h i Brown, D. J.; Evans, R. F.; Cowden, W. B.; Fenn, M. D. (1994). 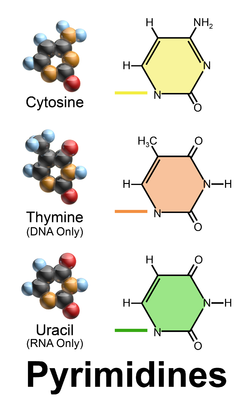 The Pyrimidines. New York, NY: John Wiley & Sons. ISBN 978-0-471-50656-0. ^ a b Albert, Adrien (1968). Heterocyclic Chemistry, an Introduction. London: Athlone Press. ^ Nuevo, M.; Milam, S. N.; Sandford, S. A.; Elsila, J. E.; Dworkin, J. P. (2009). "Formation of uracil from the ultraviolet photo-irradiation of pyrimidine in pure H2O ices". Astrobiology. 9 (7): 683–695. Bibcode:2009AsBio...9..683N. doi:10.1089/ast.2008.0324. PMID 19778279. ^ Movassaghi, Mohammad; Hill, Matthew D. (2006). "Single-Step Synthesis of Pyrimidine Derivatives". J. Am. Chem. Soc. 128 (44): 14254–14255. doi:10.1021/ja066405m. PMID 17076488. ^ Nelson, David L.; Cox, Michael M. (2008). Principles of Biochemistry (5th ed.). W. H. Freeman. pp. 272–274. ISBN 978-1429208925. ^ Marlaire, Ruth (3 March 2015). "NASA Ames reproduces the building blocks of life in laboratory" (Press release). NASA. Retrieved 5 March 2015. ^ Nuevo, M.; Chen, Y. J.; Hu, W. J.; Qiu, J. M.; Wu, S. R.; Fung, H. S.; Yih, T. S.; Ip, W. H.; Wu, C. Y. R. (2014). "Photo-irradiation of pyrimidine in pure H2O ice with high-energy ultraviolet photons" (PDF). Astrobiology. 14 (2): 119–131. Bibcode:2014AsBio..14..119N. doi:10.1089/ast.2013.1093. PMC 3929345. PMID 24512484. ^ Sandford, S. A.; Bera, P. P.; Lee, T. J.; Materese, C. K.; Nuevo, M. (6 February 2014). Photosynthesis and photo-stability of nucleic acids in prebiotic extraterrestrial environments (PDF). Topics of Current Chemistry. Topics in Current Chemistry. 356. pp. 123–164. doi:10.1007/128_2013_499. ISBN 978-3-319-13271-6. PMC 5737941. PMID 24500331. , also published as Barbatti, M.; Borin, A. C.; Ullrich, S. (eds.). "14: Photosynthesis and photo-stability of nucleic acids in prebiotic extraterrestrial environments". Photoinduced phenomena in nucleic acids. Berlin, Heidelberg: Springer-Verlag. p. 499.